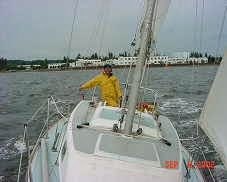 In 2003 at the Washington Yacht Club I wrote an article about the maiden voyage of the club's newest acquisition, a Ranger 26. 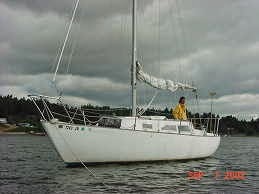 Washington Yacht Club's 26 foot Ranger had been undergoing a retrofit for more than a year and had yet to venture out into the saltwater of Puget Sound. I was lucky enough to be finishing up my keelboat skipper rating just as "Rascal" the Ranger was deemed safe for cruising. The following is a trip log from my inaugural cruise around Vashon and Bainbridge Islands on that fine boat. Carolina had reserved Rascal for her Thursday night keelboat class so the students could take it to Carillon Point and practice pumping out the holding tank. I struck a deal with Carolina so that both her class and my crew would go en mass to Carillon Point, do the pump out, and return to the WAC where we would motor Rascal on out through the locks to Shilshole for the night. 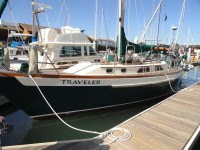 We packed up Rascal with three day's food and fuel and Carolina prepared the 22 foot Bristol, Spackle. Both boats left the dock at 6:45 PM heading E. 52 degrees magnetic. Rascal was skippered by Julie Herman with a crew of Mat, Tom, me (Scott Voltz) and my sailing buddy, Scott Tobiason. Spackle had the rest of Carolina's class aboard consisting of Carolina, Georgeana Zerbini, and Amy McNamara. We sailed from the WAC across to Carillon Pt. As the wind eased we tried to start the engine. It would not start. This was typical at the time and we half expected to have engine trouble sometime on this journey. We dropped the jib and Julie sailed to the dock, letting the main fly for a perfect landing. Then both crews listened to Carolina explain the gritty details about how to properly pump out Rascal and how to dump the porta potty from Spackle. Julie had the honor of donning the mask and gloves and doing the actual pump. Afterwards we split up, guys on Rascal, gals on Spackle. Rascal's motor started up just fine and off we roared, dumping Mat and Tom at the WAC on the way to Shilshole. Motoring in the dark, we had good timing at the Fremont Bridge and at the locks and then quietly sought out the one reciprocal mooring spot at Shilshole between the S and T docks. Damned if a stinkpot hadn't beat us to the slip and we had to shell out $19.50 at the main guest dock. The next morning after brewing coffee on board and climbing the navigation tower there at the dock, we motored out into a glassy sound and found our way to Alki Point at 150 magnetic then across the shipping lane to Blake Island, 220 magnetic. While motoring, we prepared the spinnaker rig and hoped for the wind to rise. At Blake Island we took advantage of the free 30-minute dockage policy. We stretched our legs, took a beer break, and hopped back in the boat. As we headed out into the sound through the glassy water I could see cat paws up ahead. In a few minutes a distinct wind line formed and we steered toward it. The wind came up briskly from the North and we popped the chute. On a heading of 140 degrees magnetic we brought up DesMoines a little over 3 hours later, all the way under main and spinnaker. 11 nautical miles for an average of 3.3 knots. Earlier in the day we had practiced jibing the spinnaker. You experts must forgive me here now as I wrote this as a spinnaker novice and everything about this wacky sail/kite/parachute thing was and still is a wonderful mystery to me. One method is to unclip from the guy, unclip from the mast, jibe, clip to the new guy and clip to the mast. This worked well for us with light winds. Anything heavy and the pole gets difficult to handle. An easier method is to keep the spinnaker pole clipped to the mast, unclip the guy and lower the end down to the center bow and below the pulpit and back up to the other side to clip the new guy. There is a name for this kind of spinnaker jibe. I believe it is called Dip Pole Jibing. We found that when the spinnaker pole is almost directly forward with the wind coming off the beam a whisker pole would be nice so we could get better leverage on the guy. We later found the whisker pole down in the bilge. At Des Moines we jibed again and started to head away from shore. Without the protection of the nearby land Rascal became overpowered so we dropped the spinnaker. We had a little excitement with this maneuver. We set the #2 Jib and had a nice brisk starboard haul to Piner Point where we dropped sails and motored up Quartermaster Harbor towards Burton. We dug out the anchor and dropped it into the bay's muddy bottom in 20 ft with 120 ft of rode. The harbor in Burton has many, many boats riding mooring anchors so we had to find just the right spot where Rascal could not swing across other mooring lines. At 2000, just as it was getting dark, we broke out the red wine and grilled some steaks. Potatoes and beans rounded out a hearty meal. It was a good day, logging 32 nautical miles in 11 hours. We slept like dead men. Saturday morning found the wind shifted around to the south. Our anchor was holding quite well in the brisk breeze. We took the dinghy into town and found there was not much of a town and nowhere to have breakfast. So much for Burton. With a late start we motored south against the wind out of Quartermaster Harbor and around Neil Point and Point Dalco where we hoisted the spinnaker again for the long run up Colvos Passage. Local knowledge says that the current never runs south in Colvos Passage, a nice arrangement, for sure. We averaged four knots up the passage. I had the extreme pleasure of manning the chute while my curious Swede shipmate dove down below and rummaged through both lazarettes, the hold, the bilge, every cubby, and the forepeak. He found all sorts of interesting widgets, gadgets, spare nuts and etcetera. Then we washed the boat stem to stern. We jibed at Southworth, ran behind Blake Island, and watched the wind go all to hell in confusion. Dropping the spinnaker, we deployed the #1 headsail and fought our way towards Rich Passage, eventually giving up and motoring into Port Orchard. From there we caught light winds to the entrance to Liberty Bay and motored into Poulsbo Harbor at about 1800. Poulsbo sold us a $15.00 slip so we stayed at the dock and had a nice seafood dinner out. It's a great little town, somewhat over the top with the cute German motif but a good port with plenty of services. 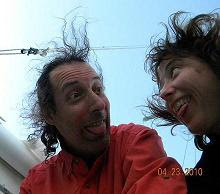 The next morning breakfast ashore was nice and by 1000 we found ourselves bouncing just outside the dock in Liberty Bay in a stiff SSE wind with the main halyard jammed a third of the way up the mast. Scott Tobiason climbed onto the boom, released the shackle from the head of the main and tied off the useless halyard. We tossed the jib halyard (leading it through with an extra line) over the spreaders and thus were able to hoist the main with the jib halyard. We reefed the main to keep its head well below the top of the mast. The jib halyard could not have pulled it all the way to the top. The #2 headsail balanced just right with the reefed main. We hoisted it with the spinnaker halyard. We had the most fun beating out of Liberty Bay with tack upon tack, keeping an eye on the depth gauge, heading up with the lifts and down with the headers. A SSE course to Point Balin then around into Sandy Hook set us up for the run through Agate Pass. It was raining lightly and the foul weather gear felt great. We ran north with the waning current through the pass and out into Port Madison, motoring through the last bit just for safety. Then we headed across the Sound at about 90 magnetic and 4 knots to Meadow Point just north of Shilshole. Two long tacks brought us near Shilshole Bay where we started up the kicker with plenty of sea room just in case it didn't start. Then it was a crowded ride back to the WAC with everybody and their dogs and their beers and their fine fiberglass yachts returning from a weekend on the water. Rascal stopped at the WAC dinghy dock and we unloaded all the gear into the van and cleaned her up. Rich was there on CTB and he loaned us a climbing harness so I could go up the mast and free the jammed main halyard. We wanted to use the main winch so we re-rigged a halyard by relocating its turning block higher on the mast then back to a headsail sheet turning block and up to the main winch. Scott Tobiason had me on the spinnaker halyard and Rich had me on the jib halyard and up I went. Once aloft, it took me a while to free the jammed halyard but finally I got it and returned to the deck. Rascal did not want to go back to the big boat dock. Her motor refused to start. She was trying to say to us, " I want to go back to the saltwater where I belong." 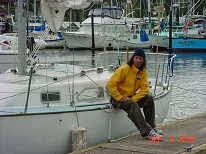 However, obligations called so I ferried her back to her mooring with Big Barge, locked her up, and said a dear goodbye to a great sailing boat and a fun three day, 90 mile journey learning the ins and outs of Rascal and the central Puget Sound.